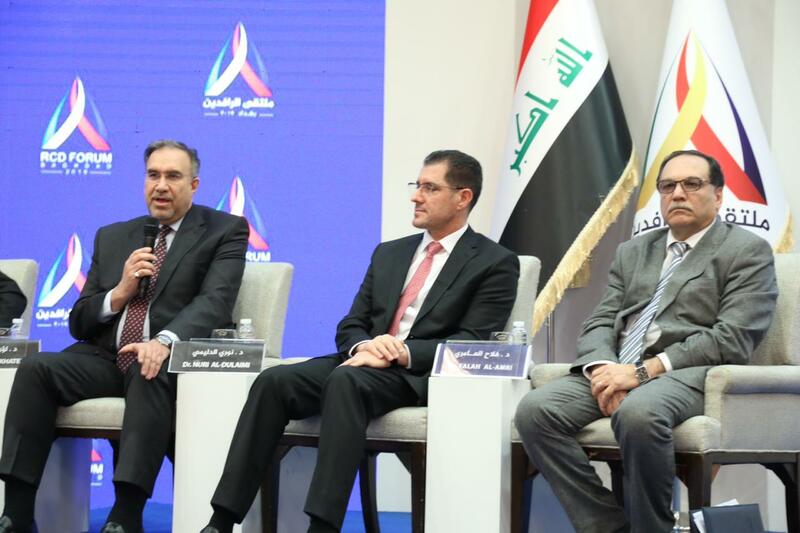 "The monetary policy occupies an important part of the economy and investment sector and the central bank participates to achieve it," Al-Aallak said during a dialogue session at the Rafidain Conference held in Baghdad and attended by Baghdad. "Monetary policy achieves economic stability. The stability of the exchange rate and the adequacy of reserves. Fundamental to the stability of the economy. " He added that "the central bank has not only achieved the basic goals, but entered the economic growth, which is unconventional policy," noting that "through the unconventional approach we have bought 20 trillion of treasury transfers and the purpose of maintaining the economic situation and move the market." He pointed out that "the central bank has taken the initiative of unconventional, the initiative of lending agricultural, housing and industrial and launched financial allocations, which is important," as he can secure financial for any real project if the necessary conditions. The second seminar at the Rafidain Conference on Monday, titled "The Middle East: Conflict and Global Politics," showed that the lack of coordination led to tensions and crises in countries. The press office said in a statement received by Al-Ghad Press that "the meeting was attended by Sabah al-Saadi, Amir Abdellahian, Saudi Arabia Abdel Aziz Saqr, UAE researcher Ibtisam al-Kutbi and the envoy of Palestinian President Mohammed Ashteh." Speakers at the second session said that " To the arrival of crises in the region to this level of the spread of terrorism and negative interventions from outside. " "The absence of coordination has led to tensions and crises among countries," he said. "The best solution to crises and the prevention of external interference, especially US interventions, requires constant cooperation and coordination among the countries of the region for the security and stability of their peoples." "Iraq has great potential and we have to compare Iraq with countries that lack energy resources." The head of the Iraqi Business Council, Majid al-Saadi, on Monday, the need to activate the reconstruction of Iraq, pointing out that foreign investment can cover those expenses without the need to budget the state, while pointing out that most of the budget funds go to salaries and others. "There must be an active role in the reconstruction of Iraq, and we must identify the parties that fund reconstruction projects, especially since the budget is mostly salaries and others," Saadi said during a dialogue session at the Rafidain Conference held in Baghdad and attended by Al-Ghad Press. "There is no investor for a country like Iraq under the complexities without an infrastructure. Investment poles are the banks, and most of our investments are in the hands of the government," he said. Foreign borrowing from global banks. " He pointed out that "corruption is a big issue that mourns the body of the state and its institutions. It is like cancer that kills investment. As investors, we want to see punishment for the corrupt to send a big message to attract the investor." "The foreign investor has requirements, but some Iraqi expatriates among them are scientific talents, businessmen and the entire middle class of Iraq, and everyone is able to play a role in reconstruction." He pointed out that "the size of investment to neighboring countries exceeds 55 billion dollars for Iraqi investors abroad, but not attracted in Iraq," noting that "countries that come out of the war builds its investment base of its expatriate sons." He pointed out "the absence of communication with the Iraqi government and prepared as Iraqi investors and expatriates to communicate with the government and creativity as we have created abroad." "In the liberated areas, there are thousands of unemployed young people who may have a negative impact on society. For example, in the city of Basra, last summer there was a storm of protests, and we volunteered and met the demonstrators and there is a lot of unemployment." "Basra is coming to another summer, and we suggest that the alternative energy to generate electricity is solar power and has not signed a single contract in this jurisdiction for 10 years. Solar home power can solve a big problem in Iraq." "The energy generated by waste incineration is also approved in most countries, and we call for a conference for Iraqi expatriate investors who are the first to build the country." Saadi concluded his speech by saying, "We hope after the removal of concrete blocks in Baghdad remove the concrete blocks in front of investment." Minister of Planning Nuri al-Dulaimi announced on Monday the directions of the next ministry to develop the domestic and foreign investment environment in Iraq, stressing the importance of relying on the basis of achieving balance between the national interest and investor interest. "Dulaimi participated in the work of the Rafidain Conference held in Baghdad for the period from 4 to 6 February," the ministry said in a statement received by Mawazine News. Al-Dulaimi said that "Iraq has an environment that is not attractive to investment because of the lack of transparency and the prevalence of administrative corruption, bureaucracy and lack of seriousness and efficiency in the application of legislation." He called for "optimizing the oil wealth, diversifying the sources of the Iraqi economy, and actively participating in the development of the structure of the chemical industry, and the prevailing and complementary industries, leading to development covering all sectors." He continued that "the Iraqi economy suffers from isolation from global developments, especially technological ones," noting the "importance of overcoming this through the qualitative benefit of foreign direct investment." President of the Republic Barham Salih stressed that Iraq is the focus of change in the Middle East and that its stability is stability for the whole region, calling on the political forces to support the implementation of the government program. 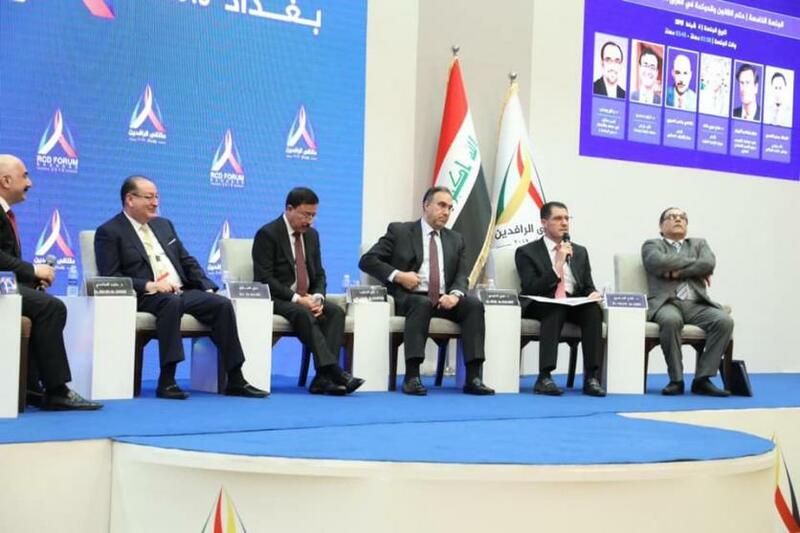 Touching the lives of citizens, came during the opening of the first international forum on Monday, organized by the "Rafidain Center for Dialogue" in Baghdad with the participation of Iraqi political elites and dozens of Arab and foreign figures from 22 countries. The Minister of Planning, Dr. Nouri Sabah al-Dulaimi, announced on Monday the directions of the ministry to develop the domestic and foreign investment environment in Iraq, stressing the reliance on the balance between the national interest and investor interest. Dr. Nuri al-Dulaimi, during his participation in the meeting of the Rafidain, held in Baghdad for the period from 4 to 4 February, that Iraq had an environment not attractive to investment because of the lack of transparency and the prevalence of administrative corruption, bureaucracy and lack of seriousness and efficiency in the application of legislation .. Of the oil wealth, and diversify the sources of the Iraqi economy, and actively participate in the development of the structure of chemical industries, and the prevailing industries and complementary to the development of all sectors, stressing that the Iraqi economy suffers from isolation from global developments, A, referring to the importance of overcoming it through quality benefit from foreign direct investment, stressing ..
On the need to increase oil revenues through investment programmed in the development of fields, and increase production capacity, and activate the efficiency of the human element in the technical aspects, through the optimization of global expertise, and beyond the barrier of what he described as "taboo" of fear of foreign investment. The political secretary of the National Wisdom Movement, Balig Abu Kallal, said on Tuesday that the entry of youth into political work is "hybrid", indicating that 90% of the parties use youth as political tools only, and most of them have been involved in the militia work. Abu Bakl said during a speech at the Rafidain Conference held in Baghdad and attended by "Al-Ghad Press", "The entry of young people to political work hybrid because most of them do not like to enter politics, but I am optimistic about the role of young people in Iraq to bring about change," explaining that "young people enter the political arena For money and some of them for power, weapons and social status, some for ideological reasons, a hybrid entry. " He added that "90% of the parties use young people as political incendiary tools, and most of them were involved in the militia work," noting that "95% of the executive office of the stream of wisdom are young, and this confirms that most of the wisdom stream of the younger generation, Knowing that we do not give them money or weapons and we promise them appointments. " The head of the Kurdistan Democratic Party (KDP), Omid Sabah, said on Tuesday that the entry of new young faces on the political process, the latest problems between the leaders of the first and energies, pointing out that preventing conflict between the first political generation and youth is by introducing the concept of " . "The leadership of the political process after 2003, the historical parties in Iraq, which took the lead in the initiative, and they who formed the political process, was the role of the shibab in it is very simple," Sabah said during a speech at the Rafidain Conference held in Baghdad and attended by " . He added that "the entry of young people into the political process, including the reconstruction of state institutions, but the most problematic between the leaders of the first and energies of the movement," pointing out that "the reasons were that the election law led to the formation of a reserve for parties is the entry of young people in individual entities, as well as civil society organizations And promote the empowerment of young people, as well as the media and social networking sites. " He added that "preventing the clash between the first political generation with youth leaders is through the introduction of a new concept of balance and Geely." The source of the "Rafidain", on Tuesday, that the leader of the coalition, "victory" Haidar Abadi and former parliament speaker Salim al-Jubouri apologized, for attending the forum. The source said, "Haider Abadi and Salim Jubouri apologized for attending the Rafidain Forum." He pointed out that "the apology for the attendance came minutes before their scheduled attendance on Tuesday." The center of Rafidain for dialogue "RCD" announced days before completion of preparations for the announcement of the start of "the events of the Rafidain 2019 - Baghdad, the first of its kind in Iraq, on Monday, after the completion of logistical preparations, technical and protocol at all levels with the participation of delegations from 22 countries." Former President Fuad Masum said on Tuesday that Iran has a major role in defeating terrorism, which is organized in Iraq. He pointed out that national reconciliation was an attendance at a conference and a luncheon and everyone dispersed later. 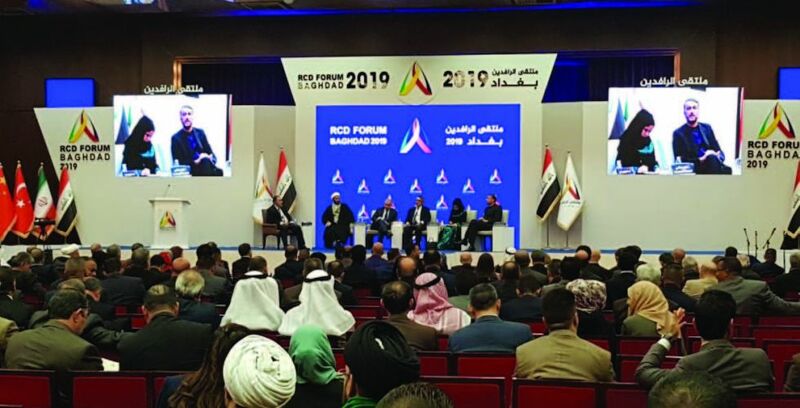 "The Iraqi people at the imams show their true role, all the components of the people have contributed to confronting terrorism and liberating their regions," Masoum said during a speech at the Rafidain Conference held in Baghdad and attended by Al-Ghad Press. "When terrorism entered the Sinjar district and the displacement of its people to Mount Sinjar they had a shortage of food and supplies and asked the competent authorities to help them through the aircraft and overcome routine obstacles." He added that "during the meetings between the political leaders focused on the internal situation and meetings between the leaders of the political blocs were very useful despite differences in views," pointing to "Iran's great role in defeating terrorism." "National Reconciliation was a presence at a conference and a luncheon and everyone dispersed later, but the national reconciliation needed to get down to the grassroots. We formed a committee in the Presidency in coordination with the Council of Ministers. Unfortunately, there was only one meeting because representatives of the Council of Ministers They did not attend. " Hassan Karim al-Kaabi, First Deputy Speaker of the House of Representatives, on Monday, that the continuation of the policy of quotas is a major cause of corruption, pointing out that the role of the House of Representatives to fight corruption is the establishment of an integrated system of legislation and work through it through coordination and participation. A statement by his press office, received by "Al-Gharab Press", that "Al-Kaabi participated in the Rafidain meeting of the dialogue held in Baghdad today, and witnessed the good hotel held the fifth session within the work of the Rafidain dialogue was entitled (rule of law and governance in Iraq implementation prospects of reinforcement) The former Spanish Minister of Justice, Dr. Salah Nuri, Chief of the Financial Control Bureau, Judge Jassem Al-Amidi, Head of the Judicial Supervisory Authority, and Dr. Kawa Hassan, Vice President of the International Institute of Obesity. " Al-Kaabi described the corruption as "a disease afflicting the Iraqi body, and its treatment is not imposed by sanctions only, but we must study its causes and symptoms, start from the past and work in the present and master the preventive policy of the future." He added that "the role of the House of Representatives in fighting corruption is the establishment of an integrated system of legislation and work under it through coordination and participation with the three institutions concerned (the Office of Financial Supervision, Integrity Commission, the Department of Inspectors General) working directly with the judiciary," stressing that "many laws I have approved during the previous parliamentary sessions, and during this session we are keen to enact laws that we call guarantors because they directly contribute to the reduction of this phenomenon. " "From my point of view, I find that" one of the obstacles to fighting corruption is CPA Order No. 55, which is still in effect until this moment, under which the system of public inspectors was established and its work within the ministries made it unable to carry out its tasks independently, not to mention the lack of resources and technical capabilities And administrative ". Al-Kaabi blamed the government on the consequences of its continued management of many bodies and leadership positions at various levels through what is known as "proxy management", which is an unsafe factor to fight corruption. , Which helps to assume the competencies of administrative positions. " "The role of the judiciary is very important in establishing the foundations of justice and its ability to charge officials and employees of all levels and citizens equally," he said. He said no, I know why some parties insist on the nomination of ministers through the political system, you may think that it will be able to implement its programs, but some blocks left the matter to the Prime Minister, and we have seen that the government chose them more feasible in the implementation of programs considered, Candidates from parties will suffer during the coming period from the pressure of their parties, which forced them even to choose their office managers and secretaries to facilitate the work of the party and not the minister, so I think that moving away from quotas is the beginning of the right path towards an Iraq free of corruption. confirmed the French ambassador to Iraq , Bruno Aubert, on Tuesday, during the seminar on Iraq 's security and economy at the crossroads of Iraq held in Baghdad that there is an expected visit by French President Emmanuel shifty to Iraq. "We know that the supporter of the terrorist has not been defeated in full and the battle is continuing in Syria and there are networks of supporters in the country and must continue to support Iraq for its war against a supporter," said Obert during the seminar. He added that "during the past years there are achievements, the most important of which is a balanced defeat and balanced diplomacy. We, as members of the coalition, are fighting against a fanatic. We have offered training programs to increase the country's potential and bring peace to the country. .
Rafidain forum in Najaf to discuss "coexistence and dialogue"
The Rafidain Center for Dialogue (RCD ) held a panel discussion on coexistence and dialogue in Najaf on Wednesday, entitled "Foundations of Building a Thriving Nation", in the three days of the Rafidain Conference in Baghdad and the last day in Najaf with the participation of delegations from two Twenty countries. According to a statement received by Al-Ghad Press and received by Al-Ghad Press, "five religious religious figures participated in the seminar, each of whom was Sayyed Izz al-Din al-Hakim, a professor in the scientific estate and son of the religious authority Sayyid Muhammad Saeed al-Hakim, Sheikh Abdul Latif al-Humim, Vice-Patriarch of the Chaldean Catholic Church in Iraq and the World, and Sheikh Star Jabbar, head of the Sabean field, and Sheikh Mohammed Mahdi Al-Takhsheiri, head of the Center for Dialogue of Religions and Debates in Iran, and the seminar was chaired by Professor Abdel-Amir Zahed. "Thank you to the delegations that visited Najaf, the prominent religious figures and the Najaf, who receive various and diverse groups and gather them under the umbrella of wisdom and dialogue," Hakim said. He pointed out that "Najaf, which lived in the era of exclusion and marginalization and displacement and imprisonment, but after 2003 demanded to live with diversity and dialogue and protected all communities and renounced violence and revenge." The opening of the first Rafidain forum with the participation of many political elites and personalities from 22 countries to discuss the most important current issues in Iraq opened in Baghdad on Monday morning 4/2/2019. He spoke d. Salah Nuri, head of the Federal Audit Bureau in the forum on the beginnings of corruption since 2003 and the flight of capital that can contribute to the development and revival of development projects as well as the absence of human development, pointing to the negative effects of quotas, for example in naming inspectors and others in the executive bodies and the absence of standards Integrity and transparency. He also referred to the remarks made by the Bureau regarding the currency auction, which was presented to the House of Representatives. He also pointed to the collapse in institutional performance and the diversification of corruption methods, especially in the field of government contracting. Mr. Hasan Al-Kaabi, Vice-President of the Chamber of Deputies, spoke about corruption and its system and the responsibility of the supervisory bodies as well as the popular control in reducing and combating it. The representative of the head of the Judicial Supervisory Authority, Judge Jassim Al-Amiri, spoke about the role of the judiciary in fighting corruption and the issues that are on the table of the Judicial Council and the measures taken against it and according to the stages of treatment and punishment, pointing to the importance of the role of the Federal Audit Bureau. The Minister of Culture, Abdul Amir Al-Hamadani, said that the forum provides a good opportunity for international dialogue in the hope that it will come out with recommendations that will advance the Iraqi reality.